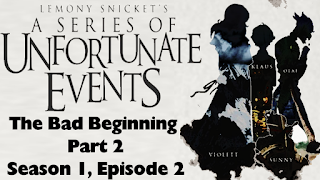 The Bad Beginning Part 2 is awesome, with Olaf coming up with a legal way to get the Baudelaire fortune, he will simply marry Violet as part of a play which would actually be real, since he’s her legal guardian he can give his enthusiastic permission for her to marry, and all she has to do is say ‘I Do’ and sign a legal document…. And it nearly works, but thankfully the plot was realized by Klaus who read up on nuptial law thanks to a book he got from Justice Strauss and presents a legal and moral argument for why the wedding is invalid. Not because Olaf is a vile human being, but because Violet signed the document with her left hand instead of her right. The fact that Olaf’s scheme nearly works is quite ingenious cause in my view, as he takes full advantage of the law… and it actually takes one hell of an argument from Klaus to get Justice Strauss to make it invalid. Which raises the question as to why it did… well for lack of a better term… Strauss is a bit soft in the ‘backbone’ department, and was actually convinced by Olaf to actually be in his production to make his plan to marry Violet even more legal, playing on her desires to wanting to be an actress. Let’s face it, Olaf had just about every single base covered, including holding Sunny hostage to ensure that Violet go through with the all to real performance. 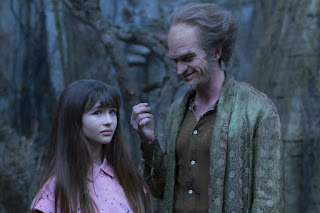 That said there are two scenes in this episode that stand out to me, one is Neil Patrick Harris as Count Olaf and Louis Hynes as Klaus Baudelaire going back and forth over his scheme, and young Mr Hynes more than holds his own against NPH in terms of not being blown off screen, since NPH is very over the top with his performance, it’s a very well pace and crafted scene that shows the intelligence of Klaus and the devious vile nature of Olaf. 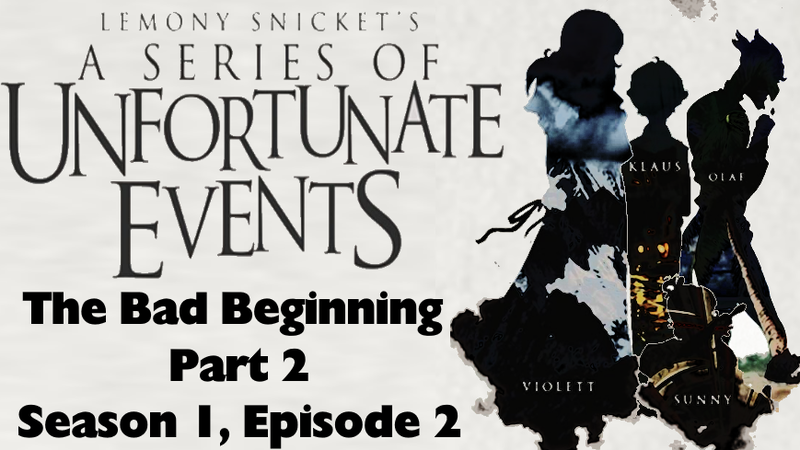 The other scene I just loved… Sunshine playing poker with the Hook-Handed Man to escape from a birdcage and to have him bring her down to where Olaf’s all to real wedding with Violet was taking place after the plan was exposed. Here’s the advantage of having a baby that you say can do incredible things (such as having four teeth so sharp she can chop parsley easily), you can have her simply be off the chain vocally cause only her siblings can understand her or have her be one hell of a card shark when it comes to playing poker to get herself freed. Some things I’ve notice is that there seems to be a reoccurring image of an eye, such as on Olaf’s ankle tattoo and on the floor of the cell where the Baudelaire’s parents are working on their escape. What does this mean I don’t know cause I never read the books, but Justice Strauss did have a book about the incomplete history of secret organizations. Also exactly how damn strict is the Baudelaire’s will when it comes to what should happen with the kids, cause clearly Strauss would make the best guardian… but I’m guessing when the books were first written they were done as an ongoing series in mind, so a ‘happy ending’ is out of the question.